12mm round, flat (coin-shaped); about 3.5 mm thick. 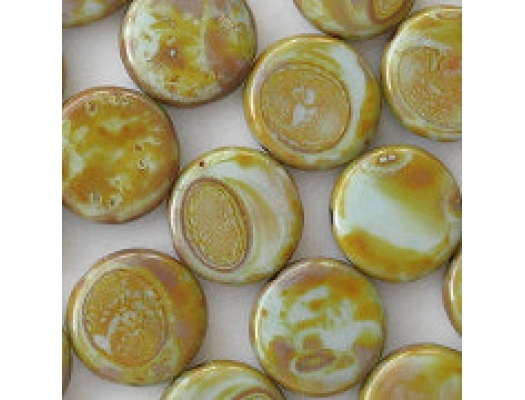 Opaque light blue (or perhaps light aqua) with a yellow-brown (olive?) picasso coating. Picasso coatings are applied by laying the beads out and washing them with chemicals. 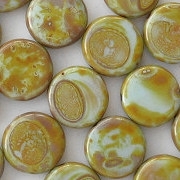 Beads which are flat on the surface will show rings in the coating (as you can see above). I don't care for the look, but I don't count it as a defect. A few beads will be completely covered with coating on at least one side, and some have very little coating on them (if you enlarge the picture, you'll see one). I'm not counting those beads as defective either. 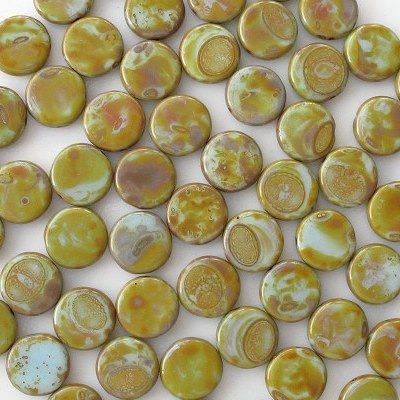 The picasso coating that comes from this supplier is very yellow-green instead of brown, as is usually the case. But I think the beads look nice.